Thomas Deo Edwards (1894-1946), was born on April 24, 1894, son of Thomas Edwin Edwards (1864-1940), a farmer, and Izaetta Jane Griffin Edwards (1868-1935) at Eugene, Oregon. He had two sisters : Ruby and Vera, and two brothers : Keith (1902-1984) and Stephen (1905-1983). He graduated high school and entered the University of Oregon. According to his World War I Draft Card he was still a student at the University of Oregon and lived at 1508 Oak Street, Eugene, Oregon. He was of medium height and build with blue eyes and brown hair. He was a veteran in World War I, Private 1st Class, 361stAmbulance Corps, 316th Sanitary Train. He was discharged on May 10, 1919. In 1920, he worked as a night watchman at the power plant in Eugene. In December 1927 he applied for membership in the A.N.A. and was given Member No. 3258. In public life he dropped his first name "Thomas" and went by his middle name "Deo". In 1926, he was the manager, Hotel Electric, Oregon City, Oregon. In February 1932, he purchased the Tourist Hotel, 524 ½ Main Street, Oregon City, Oregon. He was a collector specializing in the highest grade U. S. half cents according to his letter dated October 8, 1928 to Henry Chapman, Jr. Fig. 1. Letterhead of the Electric Hotel with note sent by Deo Edwards to Henry Chapman, postmarked October 8, 1928, 9 A.M., Oregon City, Oregon. 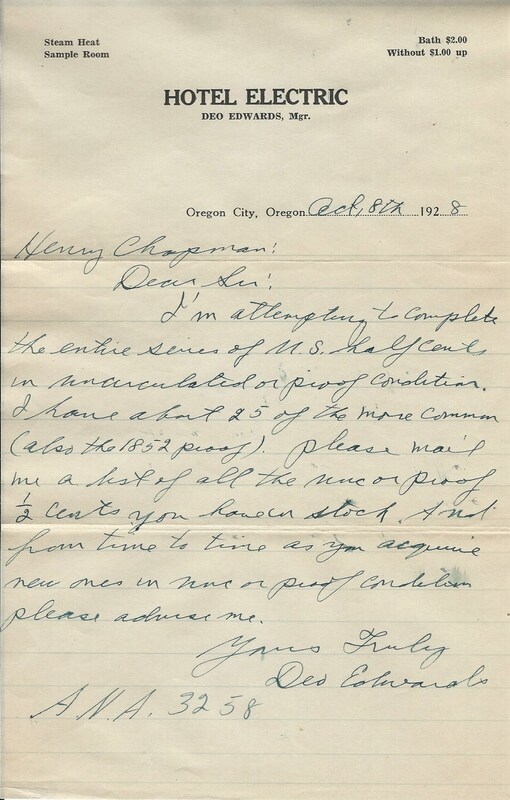 "Henry Chapman : Dear Sir : I'm attempting to complete the entire series of U. S. half cents in uncirculated or proof condition. I have about 25 of the more common (also the 1852 proof). Please mail me a list of all the unc. or proof 1/2 cents you have in stock. A note from time to time as you acquire new ones in unc or proof condition please advise me. Yours Truly Deo Edwatds A.N.A. 3258" Courtesy of the Lupia Numismatic Library, Special Collection, the Chapman Family Archive. Over the years he wrote to Henry Chapman buying half cents. What happened to his collection is unknown. He died of apoplexy on March 7, 1946, at age 51, 10 months and 7 days. He is buried in the U. S. veterans burial grounds, Lincoln Memorial Park Cemetery, Portland, Multnomah County, Oregon.